Impossible Fossils; we all learned in the early days of grade school, fossils are found imprinted on rocks or actually are ‘rocks’ that are petrified, in either circumstance, science is sure they were formed thousands of years ago. From time to time we hear about fossils that just don’t make good geological or historical sense. 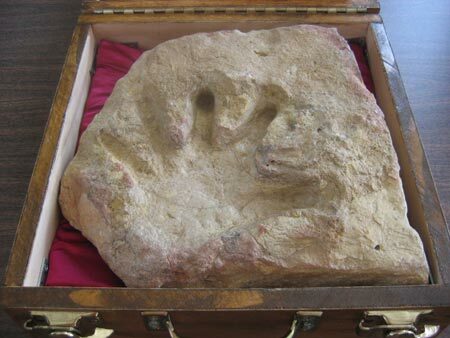 The fossil of a human hand-print displayed above, for example, was reportedly found near Weatherford, TX in 1995; it’s embedded in limestone estimated to be 110 million years old. Many folks are quick to point out that the petrified fossil displayed here looks an awful lot like a human finger; it was found somewhere in the Canadian Arctic and also dates back 100 to 110 million years ago. And what some say is the the fossil of a human footprint, possibly wearing a sandal, was reportedly found near Delta, Utah in a shale deposit estimated to be 300 million to 600 million years old. Evidently the “shoe print fossil” was found by Albert E. Knapp, an employee of a Nevada Mining Company, on January 15, 1917 . . . Two of the earliest reports about the fossil were published on March 19, 1922 in the New York Times, and another more detailed report appeared in the October 8, 1922 article by W. H. Ballou in the American Weekly section of the New York Sunday American. 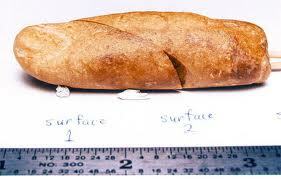 The latter article was titled “Mystery of the Petrified Shoe Sole”. If you think fossils are the only items that are routinely placed into the problematica category you’re wrong; that fallacy was ‘brought to light’ right here on a related topic “A Catastrophic Theory of History” a few months ago (October 14, 2012). So, it’s not that unusual to find objects you might find in a typical workshop or machine shop scrap bin. They’re obviously manufactured but this assortment of metal eyelets, spirals, springs, and other metal objects have been found in layers of sediment dated as much as 100,000 years old! I’d guess it was really hard to locate a good metal foundry in those days. The biggest problem evoked in the examples cited here is that humans were not supposed to have been around 65 million years ago (or more) when the dinosaurs roamed, much less, folks who could work metal. But if that’s true, how on earth can science explain oval shaped metallic tubes dug out of 65-million-year-old Cretaceous chalk formations in France? Before that seemingly unbelievable factoid escapes you, think about these additional reports: In 1885, a block of coal was split open which revealed a metal cube obviously worked by someone other than the dinosaurs; in 1912, an employee at an electric plant in Arkansas, broke apart a large chunk of coal which reveal an iron pot! If such reports were few and far between, perhaps such events could be described as rare anomalies, but there are many, many more such, shall we say irregularities? Do you believe such reported discoveries are strong enough evidence that proves a long-lost but advanced civilization that we’re unaware of? If not, who would you guess was around to create such baffling objects, time travelers or someone ‘from a planet far, far away’? The alternative to one or the other of those choices suggests an awful lot of elaborate hoaxes.